2. Wash peppers well; trim to remove stems and seeds. Peel, core and wash onions. Cut peppers and onions into large pieces. Coarsely grind peppers and onions (see Note at end of procedure). 3. Measure 5 cups of each type of ground bell peppers with their juice, and 1-½ cups of the ground onion, including juice. Combine the measured peppers and onions with the remaining ingredients into a large stockpot. 4. Bring the mixture to a boil over high heat. Reduce heat and cook at a low boil for 30 minutes, stirring often to prevent scorching. 5. 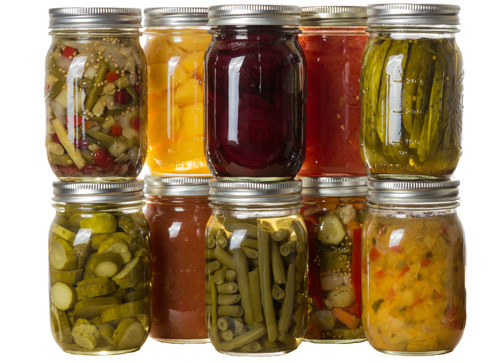 Fill the hot relish into prepared hot pint jars, leaving ½-inch headspace. 6. Remove air bubbles and adjust headspace if needed. Wipe rims of jars with a dampened clean paper towel; apply two-piece metal canning lids. Note: For recipe development, peppers and onions were ground using a stand mixer grinder attachment with the coarse blade.